Spring has sprung and the frogs are croaking in our pond and for us, in the Rainy Day Mum household, that means that we are going frog crazy again. 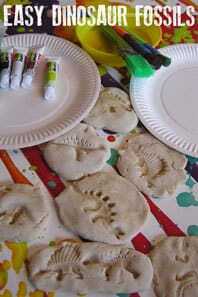 We have raised our own tadpoles for many years and we love creating crafts and activities on the theme of frogs and tadpoles. 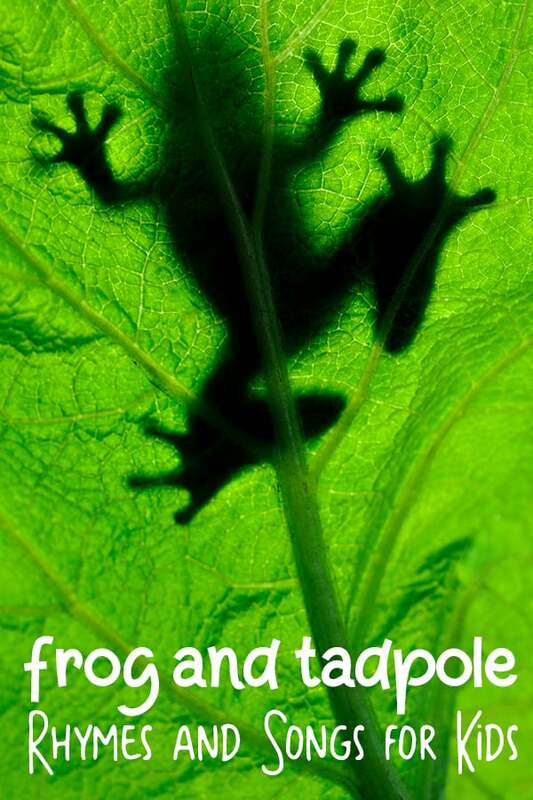 Today we have something to add to that some of our favourite Frog and Tadpole Rhymes and Songs to share with your kids. 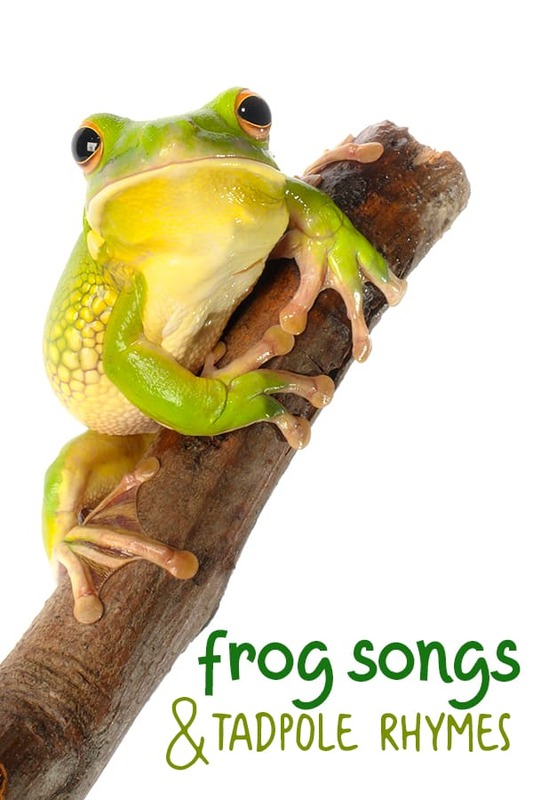 One of our favourite classic nursery rhymes and counting songs that we song over and over again with kids when they were toddlers and preschoolers is a frog song. But there are a few others that we sang as well. 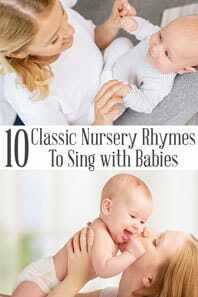 Below you will find these rhymes about frogs and songs with the lyrics. 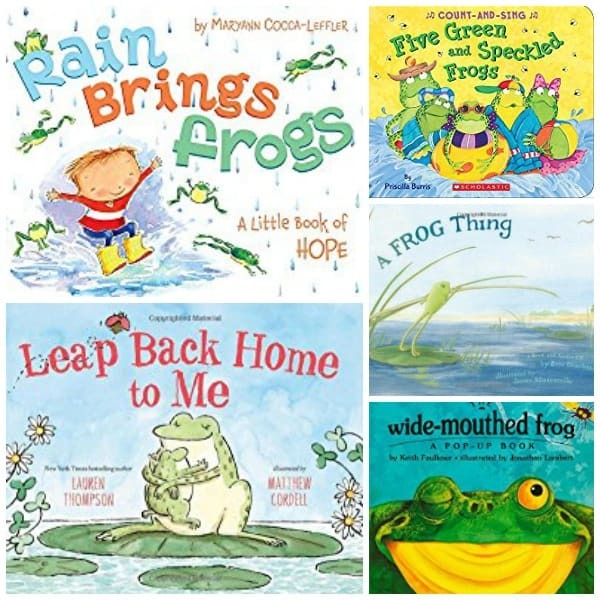 Before you do start singing and hopping around though check out some of the frog activities and crafts we have in the link above or if you would like to add some books on this theme to your book basket then we have a list of favourite frog and tadpole books for toddlers and preschoolers that my kids enjoyed. 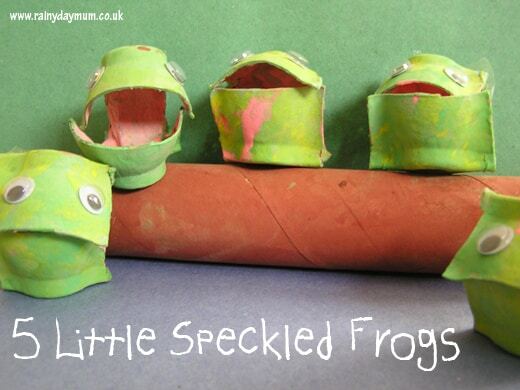 By far the favourite of our frog nursery rhymes is Five Little Speckled Frogs. 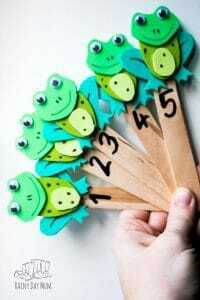 We have made egg carton frogs inspired by this rhyme, created a simple counting game and even made our own rhyme props that we bring out each time we sing the rhyme. This rhyme is great for counting backwards from five and my kids loved hopping and pretending to be the frogs in the rhyme when they were little. The sofa would often by the log and the floor the pond that they would jump into or their toys would as well. And now there are 1, 2, 3, 4 green speckled frogs! And now there are 1, 2, 3 green speckled frogs! And now there are 1, 2 green speckled frogs! And now there is only 1 green speckled frogs! And now there are NO green speckled frogs! My kids loved doing this rhyme but instead of singing glub glub they would close their eyes for the first “glub” and then poke their tongue out for the second. 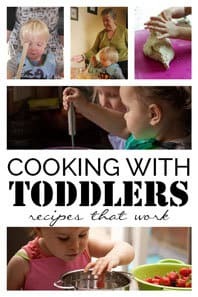 It may have been to do with the fact that this is what I did with them for a second verse but as babies and young toddlers it had them giggling away so it was something that we continued to do as they got older. Glub, Glub went the little green frog one day! Glub, glub went the little green! And the frog went Glub, Glub, Glub! They don’t go Glub, Glub, Glub! Any song that involves counting is a favourite of mine. I love that it introduces kids to numbers from very early on. 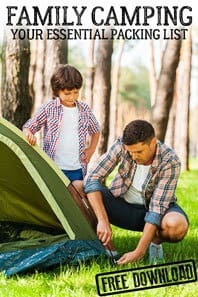 At the bottom your will find a link to our Top 10 Counting rhymes, but within our themed songs and rhymes here on Rainy Day Mum we try and include others that we know you and your kids will enjoy. 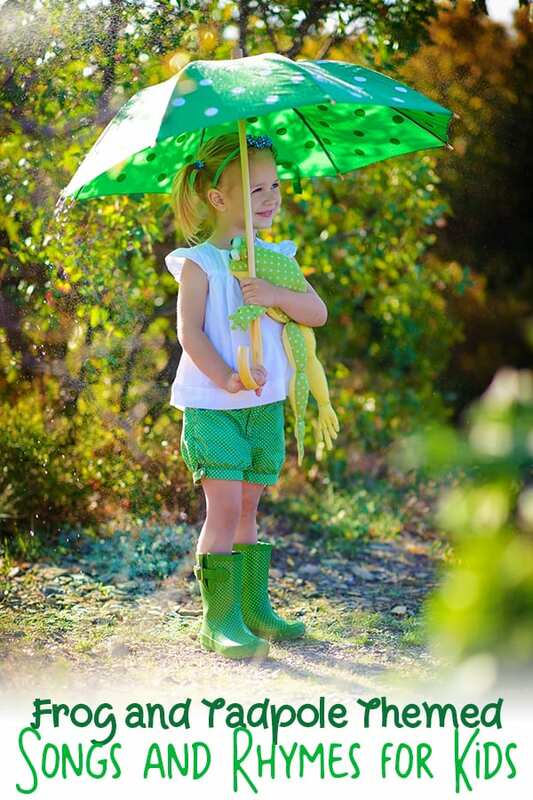 This one focuses on a fanatstic spring theme and would be great to sing along with any of our other spring themed rhymes or if you are focusing on frogs and tadpoles to do it then. 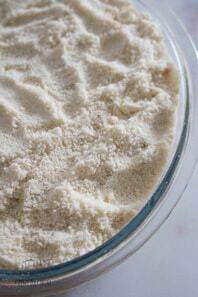 It is sung to the tune of Five Little Pumpkins and is fun to rhyme with your toddlers and preschoolers. 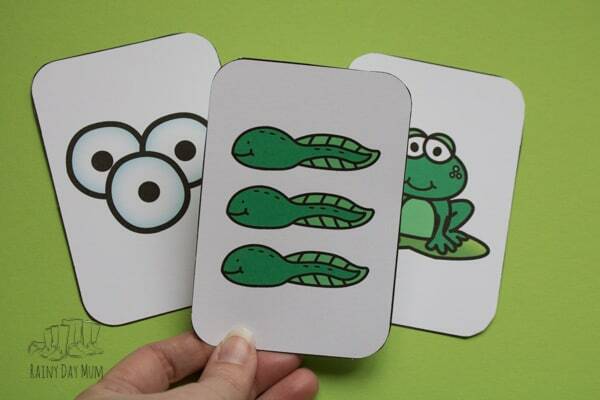 Isn’t that a fun way to learn about the frog life cycle – if you want to play a game at the same time they we have a FREE printable frog memory game and life cycle sequencing activity that you and your toddlers and preschoolers can play together. This was a silly little rhyme we found in a poem selection. 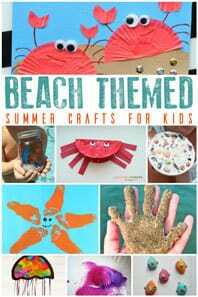 I like silly and fun as it’s great to have a laugh and my kids loved the thought of the Frog blowing bubbles at the end. In fact we have a fantastic bubble blower that was frog shapped that I found on Ebay that was inspired by the fun that we had with this rhyme about frogs. Although a few versions of this the one that we like the best is the one that uses the tune of I’m a little Teapot. I’m a little tadpole, long and slim! In the water watch me swim! As the sun gets higher watch me change! Spout my legs and lose my tail! I’m a little froglet with my feet! I’m still growing watch me change! When my tail is gone watch me leap! 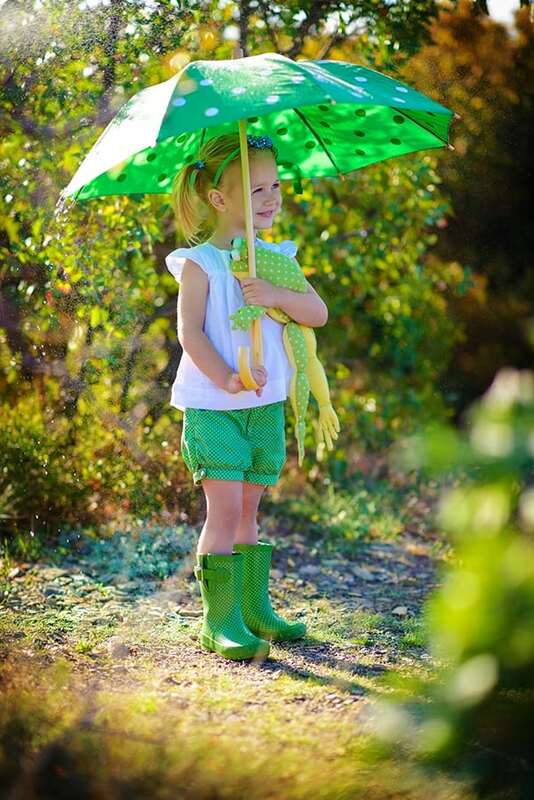 I’m a little frog now, bright and green! We have put together a playlist of watched tadpole rhymes and frog songs that you can share with your kids over on YouTube. 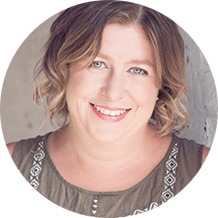 Each video has been watched by us throughout and is safe and ideal for you and your toddlers and preschoolers to have some hopping, croaking fun as you join in with the songs.